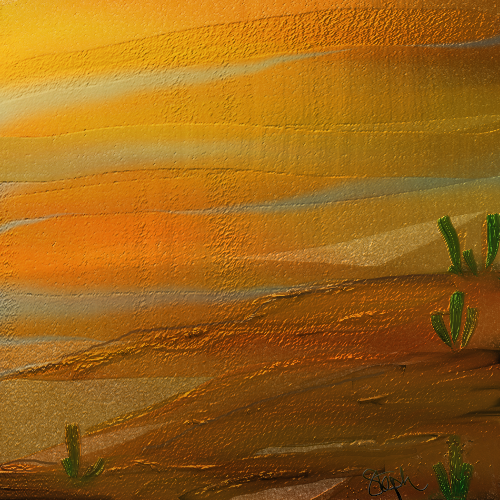 Desert Soltice by Steph Abbott. Saturday, June 21, 2015. Inspired by the Summer Solstice, I created this image and haiku this morning in the cool airs of my home before braving the desert heat to run errands around this desert locale. I created the image using ArtRage 4. Summer solstice for Indians is a very sacred occasion. We had the International yoga day yesterday. Every year in Northern hemisphere, the Summer Solstice falls on June 21. It is the day when Day is longest and the night is shortest. It is the day when Earth is at its closest distance from the Sun on its orbit. From the perspective of yoga, the Summer Solstice marks the transition of Sun from Uttarayana to Dakshinayana, according to ancient Vedic Calendar. According to Vedic Books, it was the day when Lord Shiva, first taught Yoga to his disciples. The knowledge of Yoga first descended from Shiva on this day. We can say, June 21 as the Birthday of Yoga. This is the reason why several Yogic Preachers had advocated celebrating June 21 as the International Yoga Day. That is fascinating information for this western gal. Thanks for sharing, Ramana! Your talent continues to amaze me. I love the 3D effect of this artwork! Lovely!